Truly, i believe i have been under attack all of my life. Every great change i have ever attempted led to some kind of disaster coming out of nowhere. In fact, i'm thinking about starting up a(n online) business concerning all this ultra-light gear and such. Y'know, i was walking around in the local 'outdoor' shop and i notice they lack many of the most amazing products i've been learning about online lately: less-than-a-lb tent, sling rucksacks, heelless shoes, etc. etc. Not to be found. I'm thinking about putting up an Ebay shop and such where one might get all of these items [i.e. without having to scour the net looking for them!] and a great bright side to that would be... i'd have a collection of such ultimate gear with me if the sht ever hits the fan [talk about bartering gear...]. Anywho, nice dreams. Maybe within a year [and those are much better prospects than i've had in about a decade]. It sounds as if you may have found a much-needed niche, as prepping is increasingly on people's minds right now - even going mainstream. Would love to hear about the Project Camelot interview when you have time to share. ... interview with Inelia Benz. Really, who can take me seriously after a statement like that? Still... It's my truth. So, if this interdimentional being left this realm and freed me from his wrath/vengeance [though not freeing me from the wrath/vengeance of the the coven he once led...], i had a chance of becoming free again. I'm just saying... I have fought battles that most people would find imaginable or unbelievable. Which to me is quaint since they are very real to me... [and had awesome real-world consequences!]. Anyway, so i take these things quite seriously though i'm sure there are billions who would laugh to my face for discussing them. Eben, as the German say [translated: "whatever"]. To me it is all quite real. To this day. P.S. and btw, again, one of the many values of posting on this forum... by finding this interview i learned that she has a youtube channel... Awesome! I had no idea and i'm investigating now [i.e. thanks to your inquiry]. How did you come to learn this information about your past? Her comment that we have access to a whole range of under-used abilities (telekinesis, remote viewing...), but that they may lead to a dead-end in terms of spiritual development if used in service to ego, made sense. Of course, some of it can't be turned on and off, such as dreaming. Interesting that she explained the link between the gifts of healing and speaking in unlearned languages (tongues? ), e.g. the conversation with the Brazilian. The ability and willingness of a human given over to such advanced evil to repent and be transformed @ around 1:02:00 was powerful. Also unexpected: one usually expects STS beings to remain on that trajectory, but apparently this being had reached the apex of worldly power of his STS journey and found the end point to be empty...in other words he had reached bottom. Very instructive that she could only be of use in that situation without judging it. Weaker humans might need to discern the evil and separate from it, in the same manner that she had advised the skilled exorcist fellow not to enter the house. But she wasn't an ordinary weak human. One wonders about the early childhood of the man who had followed the pure evil path. Also interesting that she uses the adjective "beautified" to describe what happens to a being that repents of pure evil. Am wondering how she was able to sit quietly in his presence without his having attempted to compromise her, given the STS propensity for conquest over good and theft of innocence. The timing must have been just exactly right, and his ripeness for transformation must have somehow provided the energy that drew her into that situation. How instructive that she and others like her were summoned by a call for help from Lightworkers who were inundated. Perhaps we could agree to try that now? May we receive Divine assistance at this dark hour in which those who would do harm seem intent upon overtaking the Earth. May the Earth be reserved as a place for the pure Light to infuse and raise the frequency of every being who passes this way, for the greater good of all. May the Universal human right to freewill and unimpeded evolution be reinforced and refereed. May darkness either elect to be transmuted or depart at this time, and may we be of service wherever can be used in this sacred task. May he be released from any dark associations in the distant past, and from any oaths which he either knowingly or unknowingly might have sworn, or any indebtedness, to any negative group or entity at that time. From this time forward, may he be free to walk in pure Light and fulfill his mission in service to others, with joy. thank you, Lori, for your intention. For now the joy lacks but the mission remains. Quite frankly, [The Power of Now in mind] i believe things like 'joy' and 'happiness' are overrated. Though it might be logical/understandable/forgiveable that those in distress cling to things like 'happiness', there are bigger issues at hand [I believe/live]. 10 years ago while i was preparing to move to La Gomera [and ended up living there for 5 months] i learned about a "Spiritual Warrior workshop" taking place somewhere in Amsterdam, where i was living at the time. I had become interested in such things because i'd become convinced that i was being viciously attacted on subtle levels by my Moroccan wife's family. Not too far-fetched a notion since Moroccans are well-known to dabble in dark magic; this people call themselves "Muslim" but they are as superstitious as they come and magic is quite popular in their culture. I did the weekend workshop but the guy doing the workshop was so impressive that i arranged a private session with him, as well. Also because he was impressed with how much i had to deal with in the way of curses stuck in my aura and such [which he dealt with]. In this private session he went into some detail concerning my past and why i was dealing with so much negativity and how i could defend myself against it. I take his input seriously because of all the things i saw him do during this weekend workshop, because of his story and because of his character. Also, in the following months and years i applied a number of techniques he taught me both during the workshop and in private. It was the beginning of great changes in my life. Actually it's funny you ask, for i don't think about it too much anymore, but the fact of the matter is that that period in my life was a source of great change and assimilation of knowledge that has greatly effected me ever since. It sounds like you met him at a good point in time. Maybe some of his teachings and methods might make a good thread? As your mattress is really one of the Big 3 in camping and survival, and as weight and quality are a big part of that, this is truly an awesome addition to real-life survival life. Youtube 'experts' are already quoting reallybigmonkey's ideas and it's no wonder. Check this guy out if you are at all interested in effective and affordable survival options. So, Titan Stormproof matches are a good place to start. But here's a vid on making a supermatch using Titan Stormproof matches. now imagine it being wet outside, cold, windy and your hands are stiff... I guess this might be one of those time the supermatch comes in. Check out this vid; it is friggin' amazing. The bug-out or EDC bag is necessarily lighter; so i guess i'd exclude hardware like the Coldsteel Special Forces Shovel, though with a heavy heart. It's not one of my favorite survival tools for nothing: it helped Zach Fowler win Alone season 3, it's an awesome hatchet, good-size shovel and makes a very decent weapon. Of all the knives i've reviewed, maybe i'm most impressed with Survival Lilly's APO-1 [short for "apocalypse 1"]; see the link/vid to understand why, but it's also because it's small enough to be part of an EDC or bug-out option but big enough to be a serious knife. After watching the following 2 vids yesterday [Saws vs Axes & Wood Harvesting Tools for Preppers], i'm thinking to cut the axe/hatchet option from my lightweight kit for good. That's because it's easily the heaviest of the EDC big 3 and if you have a good knife and a good saw option already with you, it's kinda a luxury you shouldn't be carrying around with you. Also quite bulky. I love my axe head [i wouldn't carry around the handle because of the weight, which also means it's not ready to use, i.e. also not as self-defense option] and consider it a potential tool for generations of use, so again with heavy heart... no. I'm happy that my recent research confirmed a purchase i did awhile ago: the Silky Gomboy. Especially after watching the vid i just mentioned under axe/hatchet, it's clear to me that Silky's are the way to go when chosing a folding saw. That's why youtube survivalists, preppers and bushcrafters almost all seem to favor them. And the type of Silky they seem to agree on as the best for all-round use, is the Gomboy: big enough but not too big. 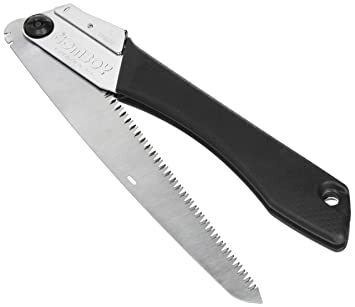 These folding saw options don't weigh much, are affordably priced [though by no means cheap], saw like crazy, last a long time and don't take up too much space [they also make less noise than an axe does, i.e. when you're trying to not draw attention to yourself]. They seem to have a single drawback: they cannot be sharpened. On the other hand, they will last a very long time. So this is where doubt creeps in, for an axe will last forever and can be sharpened over and over again. BUT... for an EDC option, the weight and bulk of the axe just makes it too much effort for that long-term promise. So bury a good axe in a cache or bug-out location and keep your Gomboy on your person. My 2 cent's worth after a lot of research. Don't forget, there's a lot of wonderful [!] hardware out there we'd all like to bring with us in a pinch, but the hard reality of EDC and bug-out is that it has to stay light (and not bulky) which demands compromise. That's a really nice looking saw - looks as if the blade locks open with the lever clamp? Why would it not be sharpenable with a file I wonder? The pole saw in the film also looked handy, though I'm curious as to whether it might be wobbly...I wouldn't have the nerve to try using it while standing on a roof though - that fellow is brave! Even though they rated the hatchet as being less useful, we'd get a lot of use from it here in chopping off the heads of fish, but someone probably makes an even smaller model for that purpose which might weigh even less? awesome, Socrates, I am copy pasting this post so people can also see it over in the firemaking videos topic (a name similar to that. You come up with good stuff.